HISTORY: The original painting from which this print was made was an acrylic on canvas produced by Olszewski in 1970. When he started the painting, he was determined to achieve a sawdust atmosphere of a Midwest carnival at night. Because the Carnegie Museum Retrospective commemorated Olszewski's evolution into the Art of Miniatures, he selected this painting as his first limited edition print. 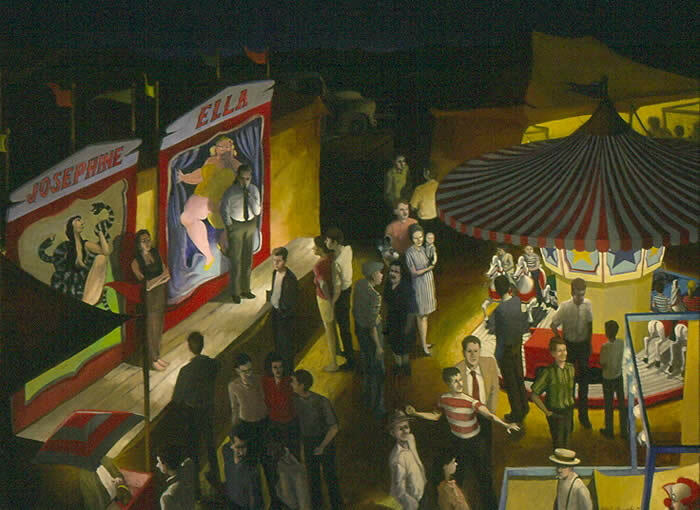 During the painting years from 1962 to 1977, Olszewski became fascinated with light and Saxonburg Carnival is an example of his experimentation with night-time subjects. The "Saxonburg Carnival" was issued while Olszewski was still under contract with Goebel. The dealer accounts base which sold Goebel products was over a thousand and an edition of 500 would have created a lot of negative feelings from both collectors and dealers. At that time, an edition of 5000 prints was not unreasonable.